A comprehensive guide to creative cross stitch with over 150 step-by-step designs in Celtic style, traditional style, folk art and contemporary style. 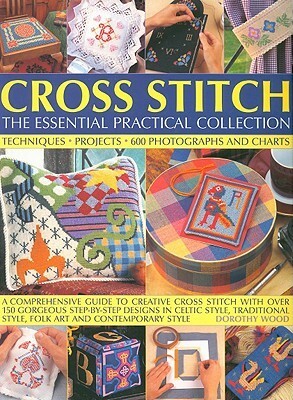 Cross Stitch: The Essential Practical Collection is a pleasing book that offers a wide range of different designs and ideas, along with tutorials on different techniques that are handy for beginners. Not all the designs will appeal to everyone, but with such a wide range you're bound to find something that appeals, and many could be adapted for different projects/uses than those shown. The only gripe I have with this book relates to the placement of the patterns and guides. In many cases you'd have to destroy the book's spine and risk loosening pages to get at them properly. I would have liked to have seen them either in a separate section at the back, or even available (perhaps using a code in the book) for online download and printing, for those who wish to keep the book in good condition. But that's just me, and others may not find it an issue.